A Bird Hunter's Thoughts: Coconut Oil? For a dog? So far, it's working like a champ! Coconut Oil? For a dog? So far, it's working like a champ! I'm a big believer in good nutrition as the foundation for good performance, longevity and health. It's just as important for my dogs as it is for me. I've settled on my dog food brand of choice (Royal Canin Medium and Trail 4300) and I'm continually looking for any additives that might benefit my canine buddies. My wife discovered the benefits of Coconut oil in her diet a few years ago. So, I started studying the "goods and others" for use with dogs. I found a few articles that interested me. Below, you will see excerpts with links to the full articles. I encourage you to access the link and read it all. Incredibly emollient, coconut oil helps moisturize the driest skin and makes a dog’s coat gleam with health — whether you add it to her diet, her shampoo, or both! Digestion and nutrient absorption are improved by the addition of coconut oil to a dog’s diet. It can, however, cause stool to loosen; if that happens, just add a few spoonfuls of canned pumpkin to your dog’s diet (go here for more stool-firming tips). Like cinnamon, coconut oil helps prevent diabetes by regulating and balancing insulin. It also promotes normal thyroid function, and helps prevent infection and heart disease. Helping to reduce weight and increase energy, coconut oil also promotes mobility in dogs with arthritis and other joint issues. Can dogs have coconut oil? The short answer is Yes. Coconut oil is good for dogs and can help aid your pets' digestion, improve their coats, help prevent infection and more. But please note, it is important to follow the proper guidelines. As with most things, too much of even a good thing can end up having negative effects. The big benefits of coconut oil comes from the type of fats it is made of. Coconut oil is almost exclusively (more than 90%) saturated fat and is one of the few foods that can be classified as a "superfood". I know what you're thinking, "Isn't fat bad for you?". In this case no. There are two groups of fats: saturated fats and unsaturated and within each group are several more types of fats. It can get a little confusing, for solid information all about fats, WEBMD has some good information. MCT's are coconut oils secret weapon. Medium chain triglycerides (MCT) is good fat, the kind that provides an array of benefits which include digestion improvement, immune system support, metabolic function that assists with weight loss, skin and coat health and thyroid health. MCT is made up of Lauric Acid, Capric Acid, Caprylic Acid, Myristic Acid and Palmitic. Coconut oil also contains about 2% linoleic acid (polyunsaturated fatty acids) and about 6% oleic acid (monounsaturated fatty acids). Ok enough of the science, now on to the fun stuff. As we've stated, coconut oil has several benefits for your dog. Let's go over a few of them. Coconut oil gently elevates the metabolism, provides a higher level of energy and vitality, protects your dog from illness, and speeds healing. 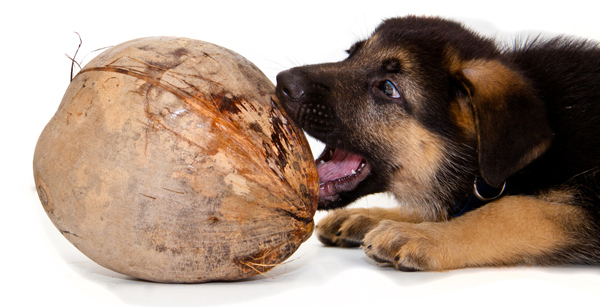 As a bonus, coconut oil can improve dog’s skin and coat, improves digestion, and reduces allergic reactions. Again, DO NOT start with these amounts in the beginning! In addition to giving your dog orally, coconut oil can be applied directly to your dogs coat and skin. As we stated earlier, because coconut oil contains lauric acid, it is a fabulous immune builder, both orally and topically. For good results, apply to the skin and let the oil absorb for about five minutes. After the five minutes, you can apply and a very light rinse. If you feel you haven't removed the excess oil, finish up with a light application of shampoo and another quick rinse. Your dog may experience some side effects from coconut oil. Generally this happens if you give too much coconut oil to your dog too quickly. We recomend that you start slowly and see how your pet reacts. The most common side effects for your dog can include diarrhea or greasy stools. We are using coconut oil for all our dogs. My dogs and her dogs. We have seen an increase in skin Sheen and energy level. The dosage amount is about 1 tablespoon per dog. The oil is a liquid when it is about 75°F. We put it in the squeeze bottles and keep it near the dog food, it is very easy to apply. As I get into hunting and trialing season, I expect to see more benefits from its use.